the report. And delinquency rates look worse than previously believed. rising $42 billion from the previous quarter…. lenders ended up writing off quite a bit after the financial crisis. Wall Street Journal, citing New York Fed data, tells us that student debt outstanding increased 4.6% in the last quarter. 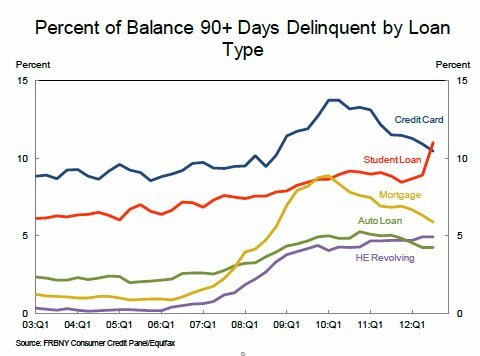 type of consumer debt to show rising delinquency rates. anyone who can fog a mirror can get a loan. Marriage is Dead. What Will Replace It? Recently, yet another marriage in my circle of friends blew up, making the unofficial tally something like 50% of marriages which I've witnessed ending within 15 years or so. And some of the surviving ones are on shaky ground. All of these people, of course, swore they'd stay together until the end. Presumably, they were sincere. Yet it's become clear that only a minority of people can realistically live up to that promise. Vowing to remain exclusively with one person in a faithful monogamous relationship until death do us part makes about as much sense as vowing to work for the same firm until the end of one's career. How could you seriously promise to be working at the same firm 30 years into the future when the firm, or even the industry, might no longer exist? 15 years after your vow of permanent fealty to the firm, you get an offer at 3 times your present salary, and you're expected to turn it down? And before you reply that marriage as a 'sacred commitment' can hardly be compared to a job, ignore what people say about their preferences and look at how they actually behave. How many people are actually treating their marital vows differently from a job or consumer product? The divorce and infidelity statistics suggest very few indeed. Marriage as an institution was created when mankind lived in primitive tribal settlements, and the average human went through life encountering the exact same 2-300 people until their death. It was also a way of ensuring financial support for women at a time when they weren't expected to support themselves. And, of course, to stabilize potentially violent unattached young males. All these circumstances have now changed: people now encounter hundreds, if not thousands of opportunities to cheat, and the social stigma against divorce and single motherhood has never been lighter and is not coming back. Already, 40% of Americans view marriage as obsolete. In the US, only the richest Americans (especially whites and Asians) have any realistic chance of a life-long marriage; the institution has essentially died out among the middle-class and below. Marriage as a universal institution which everyone is expected to enter is like Wile E. Coyote: it ran off the cliff into thin air long ago, and is just waiting to fall. So what will take its place? Unmarried cohabitation, for one thing (see the last link). But marriage as an institution is so deeply anchored in Western society that people will go on pretending to take it seriously for a few decades more. And there will still be the odd successful life-long marriage — among a small sub-set of risk-averse, traditionally-minded, highly religious people (all these traits are linked). Already, we see trends in most Western societies in which organized religion is shrinking to a core of about 20-25% of the population who are part-genetically, part-environmentally predisposed to experience strong, sincere, abiding religious faith within an organized hierarchical religion. Since no social pressure is forcing the rest of the population to pretend to take organized religion seriously, they are no longer doing so. Marriage as a genuine life-long proposal will survive only in highly religious communities. But the idea is a sound one. First, from an aesthetic point of view, it would reduce the amount of rank hypocrisy and insincerity in society. There's just something unseemly about millions of people making promises in front of their friends and family they have no ability to keep — merely because the dead hand of tradition demands it. A seven-year option would allow married couples to simply let their marriage automatically dissolve, instead of having to initiate a complex, potentially bitter divorce proceeding. You would have a series of default legal rules for splitting property and child custody. Of course, those who are happy after seven years could renew their vows, presumably by sending in a simple postcard with both their signatures. Or even online! The typical objection would be: what about the children? Well, first of all, look at the chart above. Family stability is a thing of the past. In Germany, 1/3 of all children are born out of wedlock (g), and the tendency is only increasing. Soon, in all Western countries, at least half of children will be born out of wedlock anyway. Some of those will be born into stable cohabiting relationships, but most will be born to single mothers. It's hard to see a difference between those contexts and a seven-year marriage. Who knows — the existence of an easy way out of marriage might even encourage more commitment-shy men and cohabiting couples to get married, thus increasing the overall level of family stability. And let's not forget that some of the damage done to children by divorce springs from the fact that their parents once promised they would stay together forever, then break that vow when they divorce. …you could sell magazines to annoying New York hipsters by touting interviews with Werner Schroeter and Rosa von Praunheim! More 1980s East Village Eye covers here. This unsettlingly thorough 'Danish Neve Campbell Webpage' is a pretty good candidate for inclusion in the list of 23 ancient websites that are still alive. It raises more questions than it answers: Why Denmark? Why Neve Campbell? Is there a dank basement waiting in Copenhagen for Neve if she ever meets the website's founder? And most pressing of all, hvorfor er stedet ikke på dansk? At any rate, you can follow Neve's latest news by installing AvantGo on your Hewlett-Packard PDA (note: you may have to return to 2002). United States. As you might be able to guess by the title, this will be rather academical in nature. Nevertheless, if you're interested, feel free to drop by! gotten longer and longer—a sea change that Americans have come to accept relatively quickly (largely because the targets have been people of color). which the vast majority of people arrested on nonviolent drug charges plead guilty—whether they are or not—in order to avoid such draconian prison sentences, a decision that can have lifelong implications. guide. In the United States, grandmothers are sentenced to life for first-time drug offenses. Mothers who fire a “warning shot” in self-defense at an abusive husband get twenty years in prison. Teenagers who kill their abusive pimp get sentenced to life without parole. Kids who commit crimes at 14 have been condemned to die in prison—getting raped along the way—with no consideration for their age, mental health or abusive upbringing. People land on death row for failing to anticipate that an accomplice in a crime might kill someone—and people are executed for killings committed by others who then go free. The American model—which Supreme Court Justice Antonin Scalia recently summed up by musing, “I thought that modern penology has abandoned that rehabilitation thing”—is a system rife with injustice. Seems like it's been a long time since Germans have become paralyzed with fear over something. Life here's so comfortable that the media have to invent crises and disasters, and often the only thing that presents itself is tainted raspberries or genetically-modified food or bird flu. Headlines suddenly sprout: "Tainted-raspberry Crisis Spreads Terror in Brandenburg!" "Avian Flu Set to Destroy Civilization!" "H1N1 Virus Carves Path of Death and Misery Through Unsuspecting Middle Class!" Finally, something to wet our collective pants about! Dornfinger triggers Hysteria, screamed one typical headline. The article notes that after a series of breathless press reports in Austria, 190 people streamed into the hospital in Linz in one day claiming to have been bitten by one, although only 8 'even came close' to displaying the symptoms. The spider's bite, needless to say, is non-fatal, although you might have a day or two of discomfort. The German media's falling down these days. We need a crisis, and we need it fast. What'll it be this time? Horsemeat in your Wurst? Genetically-modified Lederhosen? The creeping menace of philtrum fungus? Come on, lazy reporters, start spreading the panic. * The articles didn't mention how Southern Europeans have apparently managed to survive this fiendish predator's onslaughts for the last 8,000 years. Just a program note for those interested: Tonight shortly after midnight, 00:10, ZDF will broadcast Werner Herzog's new documentary 'Tod in Texas' (Death in Texas, but the actual English title is Into the Abyss). The ZDF website is here (g). More information in English can be found here. badly cripple Obamacare, even if he couldn't quite repeal it outright. America really does have universal healthcare. The ideological debate about whether the government should ensure basic, affordable health-care for all will gradually wither away in the U.S., as it has in every other advanced nation. And something else happened: Colorado and Washington state voters decided to legalize marijuana. Oregon said no. Marijuana is, however, still considered a Schedule I narcotic under the federal Controlled Substances Act. This is the designation given to drugs that have a 'high potential for abuse', no medical uses, and are unsafe even under medical supervision. Officially, therefore, marijuana is considered as dangerous as heroin or LSD. There will be some interesting legal battles if the federal government tries to crack down in states that have decided to let their people enjoy dope. In the long run, the specter of millions of people openly smoking marijuana and not turning into dead-eyed, shambling mendicants will inevitably undercut the rationale for keeping marijuana illegal. The Governor of Colorado, for his part, warned residents against breaking out the 'Cheetos or gold fish' too quickly. (For my foreign readers, he's not referring to crazed dope fiends eating live gold fish, he's referring to snack foods — see above — favored by cannabis conoisseurs). It's hard to paint weed as a terrifying, insidious threat when the Governor is openly joking about it. results of taking drug dogs door to door. everyone inside, including children, because they need to secure the building quickly, and they need to ensure officer safety. under the Fourth Amendment, because a sniff is relatively unintrusive. look forward to middle-of-the-night visits from the local SWAT team. seeped out of the criminal justice system over the past forty years. the gurney and filling him with poison. recidivism rate in Germany is roughly 25 percent lower than ours. could be released at no significant risk to society. I'm of two minds about this, as I'm sure Dow is as well. On the one hand, locking a 19-year old up for true life without parole is inhumane and inefficient. No matter how awful the crime he committed, the chance that he will still pose a threat to society at age 59 or 69 is trivial. Perhaps some inmates do need to be kept behind bars for decades, but the vast majority age out of their criminal tendencies. The decision whether to keep them in prison should be made by qualified experts on a case-by-case basis, not cast in stone at the moment of sentencing. As Dow amplifies in this interview (starting about 22:00), both the death penalty and life without parole convey the corrosive, cynical message that rehabilitation is doomed and that it's appropriate for society to give up on criminals. On the other hand, American voters are still attached to the idea of the death penalty for the worst murders, so it's probably necessary to propose a reassuringly harsh substitute penalty. If you have to sell abolishing the death penalty to voters, life without parole may well be a necessary substitute. But notice that 'if'. The problem here is that a major human-rights and public-policy issue is being thrown directly to the voters of California, or at least that share of them that plan to vote. There's something quaintly American about referendum-based direct democracy, but there are some issues — probably most issues, in fact — that are too complex and far-reaching to be responsibly decided by plebiscite. A couple of decades ago, for instance, California voters decided to pass a stringent anti-tax provision that, years later, continues to cause massive budget shortfalls and is contributing to the destruction of public higher education. In my view, the way to a more humane criminal-justice system is not to ask voters to replace one uncivilized punishment with another, but to make a systemic change: to put criminal-justice policy into the hands of a select group of well-informed experts who can then counsel the peoples' elected representatives on the best way to prevent and respond to crime. In other words, to adopt the European policy-making approach. Unfortunately, this is a tough message to sell in the U.S.